Jan/Feb 2011 DVD Releases: Just Passing Time or Worth Watching? The January and February crop of releases includes a number that I would like to see but only one that I’ve actually viewed. This movie about the founders of Facebook currently has a Rotten Tomatoes rating of 97%. This looks like a well-made film, rated PG-13. Here is Ebert’s review. UPDATE: I thought this was just ok. It definitely does not hedge on demonstrating the depravity of man. Timberlake and Jesse Eisenberg really are tremendous. This is the documentary based on the book and blog by Stephen Levitt and Stephen Dubner. I loved the first book, thought the second was so-so, and enjoy their blog so I’ve been looking forward to seeing this. From the previews, this film looks like “Seabiscuit 2: Extra Cheese” but the reviews have actually been solid and it is a pretty amazing true story about a horse winning the Triple Crown (of which there have only been 3 in the last 60 years). This movie looks like a great story and is rated R for violence and language. Powerful film. Watch it. Very bad language but very fitting. Read my full review here: Conviction: Who is My Advocate? I’m already not a fan of the public school system, and the director of this film doesn’t seem to be either. It’s sure to be a bit manipulative in and how the stories of these kids are told but likely a very true indictment. Wow. Very well done documentary with very effective arguments. It only served to encourage us in our homeschooling but you ache for those kids who have no choice. Not the greatest film to watch if you’re a member of the teacher’s union! This was one of those late entries into the DVD releases. 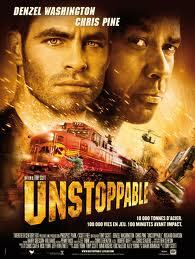 Unstoppable was a fun movie, not overacted by Pine, Denzel, or Rosario Dawson. It’s pretty predictable like any action flick but I enjoyed the 2 main characters and the back stories that give them at least a little depth. After seeing this film, I wanted to park an old car or camper on the train tracks behind our house and watch a train just destroy it! (staged, of course, with their consent!) When you watch this movie, you have to think about why you like it, especially the ending: men sacrificing for the sake of others, coming through when things are stacked against them. This was #3 on my top movies of 2010 and I wrote a review of it here. This is a fantastic movie; don’t hesitate to give it a view.